The Striped Catfish from Asia is also called the Siamese Shark. 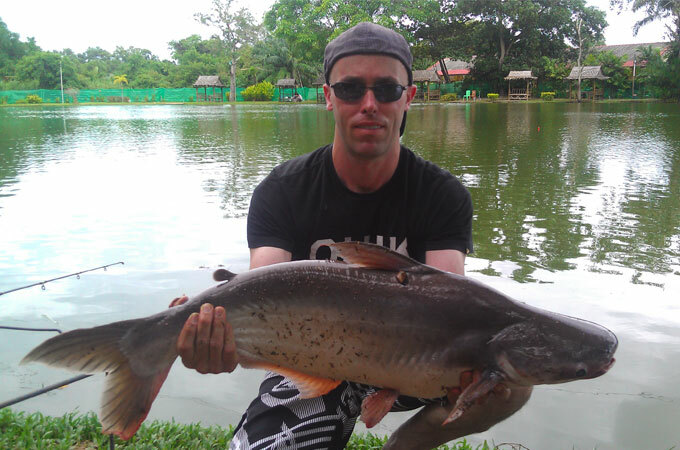 We have them up to 20kg in our Phuket Freshwater Fishing Lake. The iridescent shark (Pangasius hypophthalmus) is a species of shark catfish (family Pangasiidae) native to the rivers of Southeast Asia. It is found in the Mekong basin as well as the Chao Phraya River, and is heavily cultivated for food there. It has also been introduced into other river basins as a food source, and its striking appearance and iridescence have made it common in the fishkeeping hobby. Their omnivorous diet consists of crustaceans, other fish, and plant matter. The fish is named for the glow or iridescence exhibited in juveniles, as well as the shark-like appearance of this and other shark catfish. It is also known as Siamese shark or sutchi catfish in the aquarium hobby or as tra, swai (Thai: ปลาสวาย), or striped catfish in the food fish market, and occasionally incorrectly as basa and panga (these names should be rather used for Pangasius bocourti and Pterogymnus laniarius, respectively). Iridescent sharks originate from the large rivers Chao Phraya and Mekong in Asia, though they have been introduced into other rivers for aquaculture. They are a freshwater fish that natively live in a tropical climate and prefer water with a 6.5–7.5 pH, a water hardness of 2.0–29.0 dGH, and a temperature range of 22–26 °C (72–79 °F). They prefer large bodies of water similar to the deep waters of their native Mekong river basin. The iridescent shark is a migratory fish that moves upstream to spawn during the flood season while the waters are high and returns downstream to seek rearing habitats when the river water levels recede. Upstream migration in this species appears to be triggered by receding waters. At the end of the flood season, the fish migrate back downstream away from flooded waters. The dates of the migrations vary depending on the river system. In the Mekong river basin, they migrate upstream in May to July and return downstream during September through December. South of the Khone Falls, upstream migration occurs in October to February, with its peak in November to December. The fins are dark grey or black. Juveniles have a black stripe along the lateral line and a second black stripe below the lateral line; they have a shiny, iridescent color that gives these fish their name. However, large adults are uniformly grey and lack the striping. Adults reach up to 130 cm (4 ft) in length and can weigh up to a maximum of 44.0 kg (97 lb).